I attended the Workshop on Adaptive Media Transport organised by Cisco in San Jose, CA, on 14-15 June 2012. For our project, Martin Ellis and Conor Cahir also attended from Glasgow, along with Jörg Ott and Varun Singh from Aalto University. Jörg presented our work on Content- and Cache-aware TCP (“Poor Man's Information-Centric Networking”). This work aims to provide an pervasive TCP segment caching service, that can improve scalability of adaptive video streaming services, amongst other applications. It is intended that CA-TCP will to offer many of the benefits of the many clean-slate information-centric networking architectures, but in an incrementally deployable and backwards compatible form. More details can be found in our technical report on Poor Man's Content Centric Networking (with TCP). 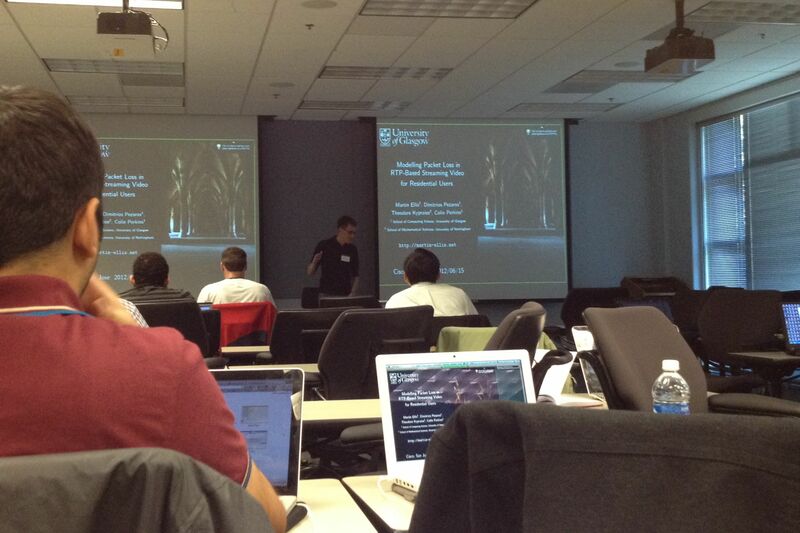 Martin gave a presentation on our work on Modeling Packet Loss in RTP-Based Streaming Video for Residential Users. This evaluates several widely used packet loss models (the simple Gilbert model, an extended Gilbert model, and 2- and 3-state hidden Markov models) against our previous measurements of IPTV performance, to determine how well the models capture the observed behaviour. Using a parametric bootstrap technique, it shows that these models are not effective for describing the behaviour of residential broadband links. A new, two-level, Markov model is developed, using both loss and delay as inputs, and shown to more accurately model packet loss patterns on residential links. Finally, Varun presented his work on Predictive Buffering for Streaming Video in 3G Networks. This uses a crowd-sourced wireless coverage mapping service to predictively pre-fetch content, to help ensure good user experience in mobile video streaming systems.